I also finished a Koigu Linen-Stitch Scarf, which I made for myself with yarn and pattern purchased at the Patternworks booth at the 2014 Interweave Knitting Lab in Manchester last spring. But it ended up that we needed it for a new catalog photo, so I had a real deadline! I love how it looks, but linen stitch makes me want to poke my eyes out with a dpn. This is the photo we used in the spring 2015 catalog. 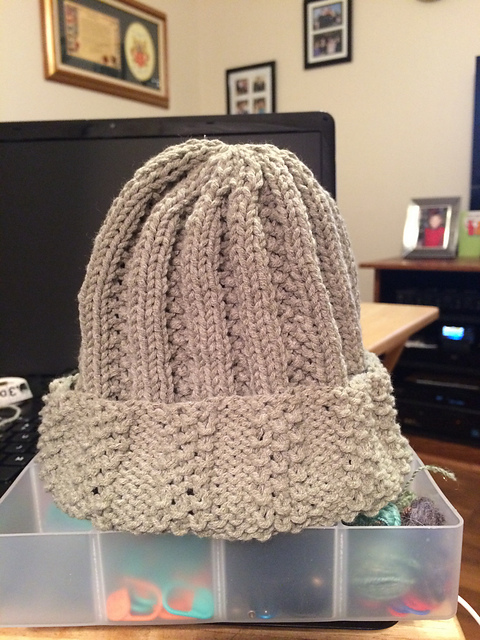 I used a smaller needle than recommended in the pattern since I tend to knit loosely, especially in linen stitch. I knit a quickie kid’s hat for our holiday “mitten tree” at work, using leftover DungarEase from my Pathways pullover. Pattern is my own Seeded Rib Hat pattern. I also finished designing and knitting a pair of socks for the Patternworks Toe-Up Sock Club. This is the 8th installment that began shipping in January 2015. Started 11/24/14, finished… sometime in December, I think – I forgot to mark it when they were finished and then couldn’t remember later! Back in December, I finally started on my Heart Sweater. 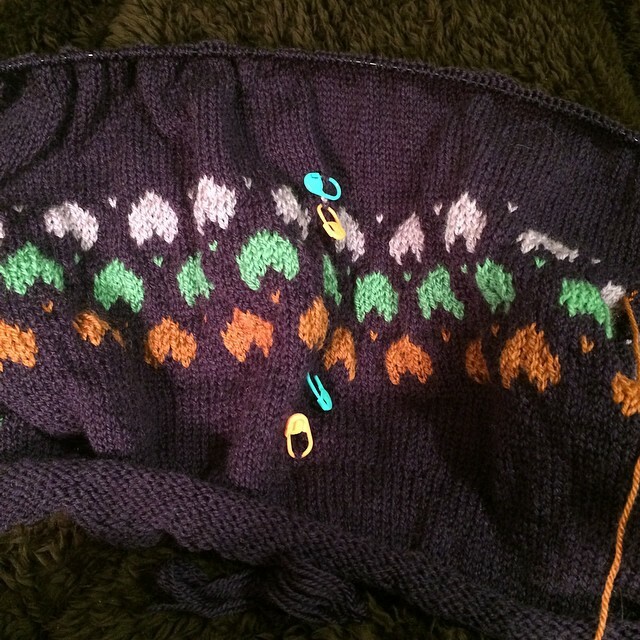 Here are the hearts (upside-down, since it’s a top-down cardigan). 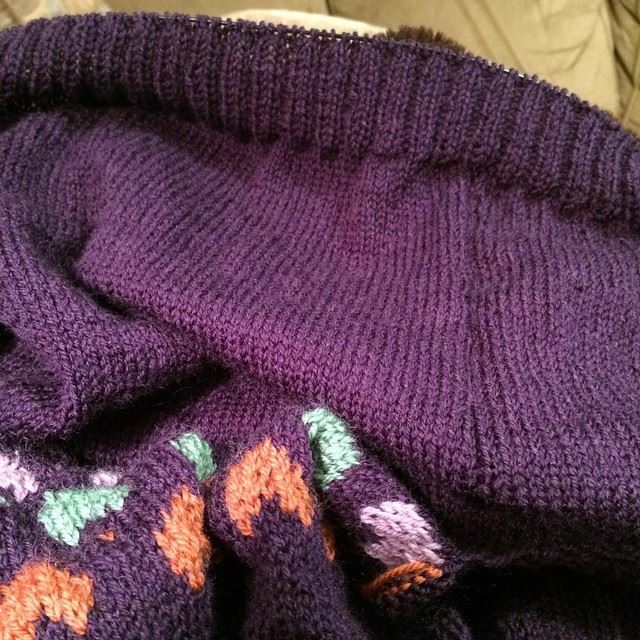 And here I was most of the way through the bottom ribbing on the body. I’ve since finished the body and have started a sleeve, but haven’t taken a photo yet. 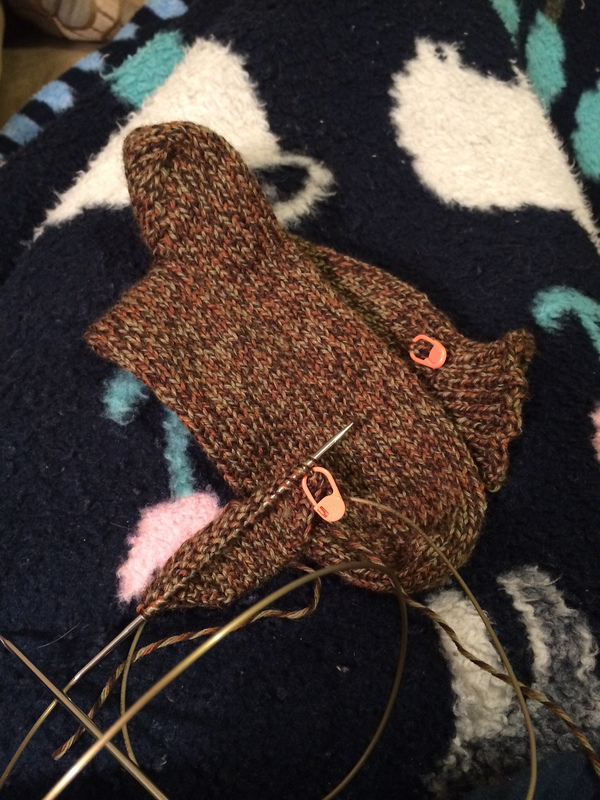 It’s actually going pretty fast considering it’s a L/XL in sport-weight yarn on U.S. size 4 (3.5mm) needles! The yarn is Classic Elite’s Liberty Wool Light. Pattern is from Ann Budd’s The Knitter’s Handy Book of Top-Down Sweaters, with the addition of the hearts. I’m combining multiple sizes as usual so it fits me better.